There are a number of standards for threaded pipe, and these form the basis for what gets used on airbrushes, compressors and the hoses that go between them. This is an old field, dating back to the nineteenth century and the need to standardize steam boilers. And like all old fields, it’s had a lot of variation over the years and collected a lot of different ways to do the same thing as a result. But the basic principle is the same: a metal pipe has a spiral groove cut into it, called “threads”, which can be carved into either the outside or inside. Normally a long pipe will have them on the outside. These are called “male” threads, since they go into the female ones; regardless of the century, engineers only have one thing on their minds. A pipe with threads on the inside is as you might guess called “female”. These are usually used on short connectors, although they can be used on pipe and connectors can have male threads. These connectors are often calling “fittings”. 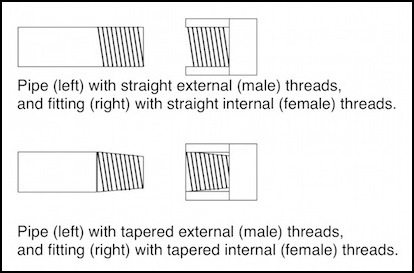 Further, the ends of the pipe can be straight, or the pipe can have a “taper”, making the end of the male section narrower than the base and the interior of the female section narrower than the open end. In a straight pipe, the threads mainly serve to hold the pipes together, and a gas-tight seal is formed only when the end of the pipe bumps into the interior end of the fitting, which may have a ring of padded sealing material (often cork or rubber) around it, called a “washer”. In a tapered pipe, as the pipe is screwed deeper into the fitting, the gaps (side to side) become smaller, until you get a metal-to-metal seal all along the length of the threaded section. This can make for a better seal, usually without the need for anything else like a washer. Around this basic concept, standards grew for the diameter of the pipe as well as the depth, “pitch” (thread spacing) and shape/angle of the threads. And different industries created different standards (e.g., steam pipes, water pipes, gas lines, etc). Eventually, these coalesced into a set of national standards, but often with variations to accommodate the existing uses. After all, why have one standard when you can have two and make everyone happy? Sometimes pipes that should fit, don’t fit as well as they are supposed to. The usual solution is to add sealing material between the threads, to help form a gas-tight seal along their length. This can be done with straight or tapered threads, and the usual method today is to wrap the male threads with a length of Teflon (PTFE) tape, usually one and a half to two turns will do. This has to be replaced with fresh tape any time you disconnect and reconnect a fitting, but the tape is cheap. Tape is not an adapter, however. Two fittings that are different can’t simply be made to work by taping the threads, because if the threads are at different spacings, or formed in a different shape, they’re not going to go together at all. Note: there’s an exception for fitting some kinds of tapered male fittings into non-tapered female ones, where the thread pitch is the same (i.e., it won’t work for connecting American and European connectors, which use different thread pitches). Here the threads won’t provide a good seal, but will hold the connectors together. And thread tape can be used to make a seal that’s adequate for the low pressures typically used by airbrushes. It’s not as good as using the correct adapter. In the U.S. and Britain, pipe sizes are given in inches, but those aren’t actually the real size of the pipe. This measurement is the Nominal Pipe Size (NPS). Just to make life interesting, these refer to the historic inside diameter of the pipe, which isn’t the same today now that we have better materials than cast iron. Despite being an interior measurement, NPS actually designates the outside diameter of the pipe today, which is always the same. For example, a nominal 1/4” (6.35 mm) pipe has an outside diameter of about 1/2”: 0.54 inches (13.72 mm), and inside diameters may range from 0.442 inches (11.23 mm) to 0.302 inches (7.67 mm). That’s a far cry from 6.35 mm. The metric versions of these nominal sizes actually equate to the British/U.S. versions, they just use metric dimensions and a “DN” label. Thus, DN 8 pipe is identical to 1/4” pipe, and this is neither 1/4” or 8mm in any dimension, although its inside diameter is fairly close to 8 mm for some materials. Confused yet? But the good part is that British, U.S., or European, when someone says 1/4” (or DN 8) they all mean the exact same 13.72 mm exterior diameter. These sizes, however, only refer to diameter, and what’s equally important is how the ends are joined, which is a whole separate set of standards. And, unfortunately, a somewhat less consistent set. Note: it’s traditional to describe hoses by their inside diameter. And this doesn’t matter for NPS pipe sizes, since you don’t put threading on the hose, you put it on a fitting attached to the end of the hose. So you won’t see a hose described as 1/4” NPS, although you may see the fitting at one or both ends described that way. Airbrush hoses are generally 1/8” inside diameter, so you’ll see a lot of hoses described as a 1/8” hose. This can be confusing since what matters is the connector, not the hose. And some websites describe the connectors, while others assume you know what connectors a “Brand A” hose has and omit that part. So it can be ambiguous if 1/8” hose means just the hose type, or the connector. The British got into the standardization game first, and their standards spread around the world. Even countries that were not colonized by the British bought their steam boilers and locomotives, and ended up using their standards for pipes as a result. The modern form of these is called British Standard Pipe (abbreviated BSP). This defines a standard thread shape and pitch for a variety of sizes of pipe (the pitch varies for different sizes of pipe, but is always the same for a given size). The sizes involved are the NPS (or DN) pipe sizes mentioned previously, so what this standard really describes is what the end of the pipe looks like for each size. The British pipe threading standard is, as noted, used around the world. Not just in commonwealth countries and former colonial possessions, but it other countries as well. British Standard Pipe threads, more commonly BSP, are defined in British Standards Institute standard BS 21. In BSP, the pipe sizes are normally described in Imperial units (inches). So you can have a 1/4” BSP pipe, sometimes described as 1/4-19 BSP to show the thread pitch, but since all 1/4” BSP pipe has 19 thread-per-inch (tpi) pitch, this isn’t really needed. You can also call this a DN 8 BSP pipe (see below), but that’s just another name for a pipe of the same standard size with BSP threads on the end. Just to add confusion, BSP is sometimes used as a generic term. While normal BSP pipe (also called BSPP for BSP Parallel) uses straight threads, there’s also a separate but less common BSPT standard for tapered threads. And sometimes “BSP” is used to mean both standards. Most of the time it’s just an alias for BSPP. Reportedly, a male BSPT can screw into a female BSPP and make a good seal against the washer (the converse is not possible), however mechanically this won’t be as strong as when both are the same. BSP is also described in ISO standards (ISO 7-1) using metric values, and widely used in Europe. In European use, “DN” numbers are used in place of the Imperial-unit Nominal Pipe Sizes, with DN 6 being equivalent to 1/8”, DN 8 being equivalent to 1/4” and DN 10 being equivalent to 3/8”. BSPP pipe and fittings are also designated with the letter “G”, so 1/4” G pipe is the same as DN8 BSPP. Likewise, BSPT uses “R”. I read on one site that this actually derives from a German designation based on how these were used, “G” for gas (“gaz”) and “R” for pipe (“rohr”). You’ll see the term 1/4” G used on a number of airbrush hoses and similar fittings, and what it means is 1/4” BSP. Thus a 1/4” BSPP pipe can be equivalently described as 1/4” G, 1/4” BSP (which can mean either BSPP or BSPF but usually the former) or DN 8 BSPP (and again DN 8 BSP is ambiguous but sometimes used as an equivalent). Japan has two JIS standards based on BSP: PF (JIS B 0202) is similar to BSPP, while PT (JIS B 0203) equates to BSPT. However, JIS PF fittings use a flared end, and won’t seal properly with ordinary BSPP fittings. JIS PT and BSPT are apparently identical. Meanwhile, on the other side of the pond, we yanks were asserting our independence (and no doubt creating deliberate trade barriers to foster local industry) by creating a similar yet completely incompatible set of standards for pipes. These came to be known as the National Pipe standards. And we settled on a tapered pipe design, usually designated by NPT (National Pipe Thread or National Pipe Thread Taper). NPT sizes are also the standard ones, described in inches. We call this the “English” system of measurement rather than the “Imperial” one that the British use, because we stopped talking to the Brits before they started calling themselves an Empire. There are some differences, but an inch is an inch in either. And since we’re using the same nominal sizes as the British (we eventually started talking to them again) a 1/4” Imperial (British) pipe is the same diameter as a 1/4” English (American) one, which as noted above isn’t really 1/4 of an inch. Unfortunately, while the pipes themselves are identical, NPT threading is completely different from BSP threading. Aside from the taper, 1/4” NPT uses 18 threads per inch (1.41 mm pitch), not 19 (1.34 mm pitch), and they’re shaped differently. You simply cannot connect NPT to BSP and expect it to work correctly. At best, it won’t go, or it will go a short distance and fail to seal. At worst, one material will be harder and cut through the other, which isn’t going to result in a good seal. And this is why adapters exist: fittings with (for example) BSP threads on one end and NPT threads on the other. However, I’ve seen online statements (from non-airbrush manufacturers) that a female BSP fitting can connect to a male NPT fitting if teflon (PFTE) tape in used to seal the threads. This apparently works at very low pressures, but how well it would work at airbrush pressures is unclear. Use of the correct adapter is a much better idea. 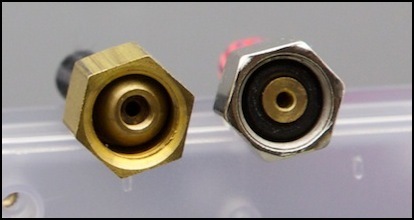 With airbrushes, the connector may seem to engage if you screw a BSP female hose onto a male NPT pipe, because the BSP connectors tend to be shallow, and may only engage the first three threads. That’s not enough for the difference in thread pitch to be apparent. A 1/4” NPT fitting needs to be about 0.4 inches (10 mm) deep to properly seal with a metal-on-metal connection. This, incidentally, is why Badger hoses don’t have O-ring seals on the compressor end; they don’t need them since they use correctly-sized NPT fittings. There is also a National Pipe Straight (NPS, not to be confused with Nominal Pipe Size) form as well, although it is less commonly used. It turns out to be important for airbrushes. The interesting form of this is National Pipe Straight Mechanical (NPSM), which is straight-threaded (no taper) and has an end with an inverted 30-degree internal chamfer. In this fitting, the threads don’t form a seal, they’re purely mechanical like the threads on a BSP connector. But here, rather than use a washer or other compressible gasket, the seal is made by the metal-to-metal pressure on the chamfered section, which deforms the metal where it comes in contact, pressing the sides in to seal it. This looks to be what Badger actually uses on their airbrush compressors (at least the one I have). I was surprised when I could measure any marked taper (there should be a 0.8 mm difference from one end of the connector to the other, and mine seemed to be +/- 0.1 mm at most). But the appearance of both the Badger male fitting on the compressor and the female fitting on the hose suggest this really is a NPSM connector. What’s interesting is that the Paasche hose I have seems to have a BSP connector (no bevel, O-ring). There are really two kinds of “metric” pipe standards. As noted above, DN numbers can be used with BSP threading to define a metric equivalent, which is standardized under ISO 7-1. But there’s also a true metric system defined by ISO 724 (and ISO 261/262), known as the “M Thread” standard. 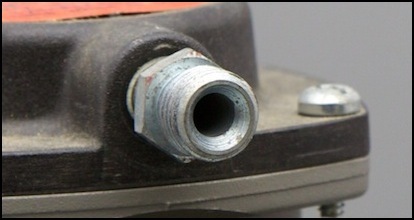 Although this is a “screw thread” standard, at least in some cases it is applied to pipes. For air lines, typical sizes are M3, M5 and M7, although all airbrush uses I’ve seen use M5. This uses the true outside diameter of the threaded portion along with the pitch (distance between two threads), both dimensions in millimeters. Thus an M5x0.45 fitting has 5 mm outside diameter and 0.45 mm between adjacent threads. In a tapered connection, the “true outside diameter” is measured at one end (I’m not sure which, but I think it’s the wider end). Depending on application either “coarse” pitch or “fine” pitch may be the default and an “M” number (like “M5”) without a pitch specifies the default. However this is application-dependent (I’ve seen both coarse and fine said to be the default), so normally it’s a good idea to specify the pitch. In particular, for M5 0.8mm pitch seems to be the default for small pneumatic lines, but Badger uses 0.5mm (or 0.45mm, which isn’t any kind of standard, sources vary). There are also a number of other standard pitches in use for speciality applications.